This is a series of instruction videos, with coach Earle Morris, along with Erin Morrissey, on getting started in curling for adults. Before stepping down onto the ice surface, the curlers should be comfortable with the most important safety issues: how to step onto the ice in the safest manner. Always step down with the gripper foot first. Do not step or jump over any rocks to get onto the ice. Get a sense for what the curling slide position feels like. The curling delivery is a complex activity that requires the coordination of a number of different body movements. To correctly develop the delivery, every curler should divide the skill into specific phases of development. You should grip the handle of the curling stone firmly. The index finger and the thumb provide the major guiding force. The release point is that location on the ice when the stone leaves your hand. Effective brushing enables the stone to maintain its momentum longer than it would have had it not been brushed thus allowing the stone to travel further. Since the amount the stone curls is dependent on time, a brushed stone will not have as much time to curl and, as a result, the stone will travel straighter. You should warm-up without a rock and slide to the back-line (a big stretch really), their next slide is to the t-line, then top 12 foot, half-way (between the top 12 and hog) and then hogline. Each slide they should try not to go past the desired endpoint to help with weight control. 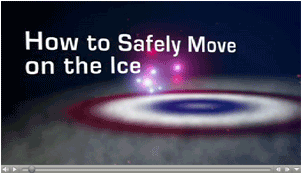 These instructional videos were produced by the Canadian Curling Association. The descriptions were adapted from PEICurling.com; the	Prince Edward Island's Curling Website.